Posted on August 23, 2018 at 5:12 pm. For the spring 2018 primary election, RACC distributed a questionnaire to all candidates running for Portland City Council; Clackamas, Multnomah and Washington County Boards of Commissioners; and Metro Council. Each candidate was asked five questions on March 13 or 14, and given the opportunity to respond by March 30 when this story was first published. Here are the responses provided by Jo Ann Hardesty, running for Portland City Council, position 3. All responses are reprinted verbatim. RACC: In what specific ways have you supported arts and culture in Portland? Additionally, I am a 12+ year volunteer at the Waterfront Blues Festival, volunteering with KBOO on behalf of the Oregon Food Bank). This past year, as the beneficiary of the event changed I felt obliged to not participate. On a more personal note, in a past life I was married to a local jazz musician, which exposed me to our local music scene. What struck me most during this time was how incredibly under appreciated world renowned artists were that lived here. I’m proud that i had the pleasure to know Leroy Vinegar (Bassist), Janice Scroggins (pianist), Linda Hornbuckle (vocalist) who unfortunately have all passed. I’m a huge fan of live music and for fun make it a point to check out old friends like Nancy King, Norman Sylvester, Mel Brown and other local musicians. In addition I have been a season seat holder at Portland Center Stage and attended the Montavilla Jazz Festival this year and was ask to provide a few words of welcome, which was an honor. Because of these experiences, I support my friends on the PDX Jazz board who are working to make blues and jazz available to young children/students to pass on this important legacy so it doesn’t die with current musicians. As President of the NAACP, I worked in coalition with our members and leaders to help create a Black Legacy Project event that highlighted and featured their creations for sale. We also provided awards to several artists in recognition of the challenges faced by artists in Portland such as high rent, dislocation, lack of visibility and marketing assistance. RACC: Artists and arts organizations add measurable value to our region’s economy, our education system and our quality of life. Yet there are a number of pressing needs in Portland that often compete with arts and culture for attention and investment. How would YOU describe the importance of arts and culture in our community, and what should Portland be doing to support this sector? JAH: Artists and arts organizations are vital to a world class city. Currently we spend 54% of flexible funding on policing services. I believe you know a lot about a city in how they spend discretionary funding. There is an enormous inequity in how we invest in cultural programs. For example, the Rose Festival has a building on the waterfront for $1 a year yet most arts organizations led by people of color have to put on multi-day cultural festivals on with no assistance from the City of Portland. I look forward to working with Commissioner Eudaly to ensure we are equitably investing in artists and arts organizations that represent the mosaic of talent in Portland. RACC: The region’s affordability is a serious concern for everyone in our community. What are your plans for making housing and creative spaces more affordable for artists, nonprofit arts organizations and arts-related businesses? Arts organizations, artists, and small business owners all are facing the repercussions of gentrification. We must ensure we maintain affordable artist space and expand access throughout the city. We also need to work to ensure that those spaces remain affordable for the long term. I will work with my colleagues to ensure we don’t miss the opportunity to address this need as a priority along with housing. RACC: The city’s Arts Tax is disliked by some, while 62% of voters approved it. Thanks to the Arts Tax, every K-5 student in the City of Portland now as an art, music or dance teacher, and dozens of nonprofit arts organizations are expanding access to the arts by providing free and low-cost arts experiences for Portland residents. What changes to the Arts Tax, if any, would you want Portland City Council to consider? JAH: I’m very concern that some retires are exempt from paying this tax while persons with income at $10,000 are forced to pay this tax. There are many low-income community members who are experiencing this regressive tax at a time they are challenged with keeping a roof over their head. We must change state law to allow us to tax those who can most afford it. Having said that i look forward to auditing this process to ensure that those least able to pay for arts education are in fact the true beneficiaries of the funding. RACC: What are some of your other priorities for the City of Portland that would be of interest to artists, arts organizations and arts educators in our community? I believe in intersectionality and know that the artistic community, in addition to specific concerns, are also concerns with broad issues impacting our society at large. What I hear most often talking to community members, is fear of being priced out of the neighborhoods people are currently connected to and believe our housing crisis does touch all of us. Additionally, I am very motivated to help address climate change through the Portland Clean Energy Fund as well as ensuring our democracy by bringing campaign finance reform to the city with the implementation of campaign finance reforms hopefully approved by the voters this Fall. Lastly, I am very interested in learning more from you on how you think the City Council can assist arts organizations and artists more effectively. I need to hear directly from you, what is working, what are the challenges of your community and what solutions to you believe would address the issues most important to you. Posted on July 30, 2018 at 2:40 pm. Our search firm, Koya Leadership Partners, has expanded the areas and communication vehicles they are targeting for the job posting and search process. Koya is confirming that applicants and their partners and families are able to relocate to Portland before presenting individuals to the committee for consideration. Many applicants are asking questions about the arts tax and the audit, so we are sending Koya weekly updates to help them stay apprised of RACC-related issues and activities. This enables Koya to share RACC’s recent successes while answering questions about the audit and other issues of interest. A second round of video interviews is being added to the interview process, enabling the committee to ask additional, specific questions before determining which candidates to bring to Portland for finalist interviews. The committee interviewed four individuals via video conference on July 17 at the RACC office. The group spent one hour with each individual, followed by a 30-minute debriefing session with the team at Koya. Overall the interviews went well, and while all four interviewees were from outside of Oregon, each person had varying degrees of knowledge regarding our local arts ecosystem. The search committee and Koya agree that the candidates are strong, and we are pleased to see that the word continues to get out — in a very positive way — about the opportunity. A second set of three or four individuals will be interviewed via video conference on August 6. Following the August 6 interviews, the committee will determine which individuals to advance to the second round of video interviews. Upon completion of the second round of video interviews, the committee will identify which candidates to advance to the finalist round, a series of in-person interviews and meetings in Portland. While details are still being determined, the intention is to mirror the approach used in the previous search, providing board, community members and others with an opportunity to meet the finalists. Posted on June 29, 2018 at 11:39 am. RACC search committee members Linda McGeady, Steve Rosenbaum and Ozzie Gonzalez, and interim executive director Jeff Hawthorne, recently accepted invitations to meet with constituents interested in the status of RACC’s search process, including 20 leaders of local arts organizations and 5 representatives from AWE – Arts Workers for Equity. RACC representatives heard questions in these meetings about the board-only composition of RACC’s search committee; encouragement to do a better job of communicating what is going on and why; and concerns about leadership in the arts in this challenging and exciting environment. We also heard words of encouragement and support, and we are very grateful for those. The search committee will continue to assess its composition and evaluate its processes on an ongoing basis. We remain committed to including more than 20 additional community members in the final vetting of candidates, and will continue to do everything possible to eliminate unconscious bias from decisions that are made. The search committee also wants to clarify that extending the search does not add significant expenses to the budget. $67,000 has been budgeted to date, including the costs associated with our executive search firm, Koya Leadership Partners. Koya is still under contract to deliver a candidate at no additional expense, but RACC may incur some additional, relatively nominal expenses in bringing out-of-town finalists to Portland. The search committee will continue to post updates on racc.org, and the job description is posted here (HTML) and here (PDF). Candidates should apply directly to Koya, but you can also contact the search committee by emailing EDSearch@racc.org. Posted on June 8, 2018 at 1:53 pm. The new RACC Search Committee has met twice, and meets every Tuesday morning. The job description has been updated and reposted to reflect a slight increase in the salary range. Our recruiter, Koya Leadership Partners, has also increased the number of sites where we are posting the opportunity. We expect to review several new candidates this summer, and will then reconvene approximately 40 community members as part of a confidential interview process. To apply or to recommend a candidate, please contact Koya directly at mbonoan@koyapartners.com or submit your resume here. We would also greatly appreciate your help sharing the updated job opportunity with your networks: https://koyapartners.com/search/racc-executive-director-21. We’ve received some questions and comments about the new search committee, and wanted to provide some background information that will set the context of where we are today. RACC is a 501(c)(3) nonprofit that receives both public and private funding. The public funding is governed by multiple contracts and oversight bodies (including: The City of Portland, Metro, and Multnomah, Washington and Clackamas Counties). RACC’s independent, voluntary Board of Directors is responsible for setting RACC’s vision, approving RACC’s budget and providing fiduciary governance, including hiring, oversight and support of the executive director. Because RACC relies largely on public funding, we have a heightened obligation to be inclusive, representative, equitable and transparent in our decision-making processes, above and beyond what is expected of most nonprofits. We do our best to answer all questions regarding our search, except when to do so would compromise the confidentiality of committee deliberations or candidate privacy. Most candidates in the process request that their applications remain confidential. A common question is: Given RACC’s commitment to transparency and community involvement, why is the search committee now limited to five board members? Given the need to continue and complete the search expeditiously (and with minimal budget overruns), the Board agreed in April of 2018 that a committee of five people was the ideal size to have an accelerated but comprehensive, equitable and deliberative process. The Board’s new Search Committee is continuing the search and will recommend one or more candidates to the Board. As with the previous search round, the finalists will be offered confidentiality and the Search Committee’s recommendations to the Board will be non-binding. Our Search Committee is committed to utilizing RACC’s equity lens and listening to the community. Throughout this search, we remind ourselves who is impacted and whose voices are missing from the decision-making table, and how to address those gaps. We acknowledge that we all have biases, and we work to disclose and eliminate them. Our committee is being candid with itself and with the community. We need to face, and then quickly overcome, tough challenges. We need to make decisions quickly, but not too quickly – a small and cohesive committee is more able to be nimble and responsive. In addition to the committee, more than 40 community members (including some from board and staff) will participate in the evaluation process, and their feedback will help the Search Committee to decide on a recommendation for the RACC board. Here is the list of previous RACC search panel participants from semi-finalist panels. We will invite these previous participants back, and will be reaching out to people who expressed interest but were unable to attend. A limited number of additional panel spots may be available. Please email the search committee if you are interested EDsearch@racc.org. We value the community’s input on how we can do better, and we thank those who have proactively shared their concerns, suggestions or support. Continue listening and responding to the phone calls, letters and emails we receive. To apply or to recommend a candidate, please contact Koya directly at mbonoan@koyapartners.com, or submit your resume here. We would also greatly appreciate your help sharing the updated job opportunity with your networks: https://koyapartners.com/search/racc-executive-director-21/ . Posted on May 22, 2018 at 12:55 pm. On May 22, 2018, RACC participated in a Portland City Council work session with Portland Auditor Mary Hull Caballero and her staff as they presented their findings from a 9-month performance audit of the organization. This is the first ever audit of RACC, and was requested last summer by Portland Mayor Ted Wheeler and Commissioner Nick Fish. The audit presented an opportunity to examine the relationship between RACC and the City as we negotiate a new five-year service agreement with the City. The Arts Commissioner and the Mayor should work with the Arts Council, City leaders, City agencies involved with arts and- culture, and community stakeholders to: (a) Assess the state of arts and culture in Portland; (b) Identify needs; (c) Develop clear goals, vision, and strategy for arts and culture for City Council adoption. The Arts Council should conduct a strategic planning process to clarify the organization’s mission, goals and vision for arts and culture. Update bylaws to reflect governing agreements. City Council should review the intergovernmental agreement with the Arts Council, and in conjunction with other jurisdictions party to it, recommend changes that reflect the appropriate level of board representation and funding from each jurisdiction. The Arts Commissioner, Mayor, and the Arts Council’s Executive Director should update the contract, consistent with the City’s goals for arts and culture. The Arts Commissioner and Mayor should appoint a contract administration professional to: (a) Monitor compliance with the contract; (b) Provide technical assistance on performance measurement and reporting to the Arts Council; (c) Review the annual budget submitted by the Arts Council; (d) Develop a consistent mechanism to track all City funding to the Arts Council; (e) Develop procedures for the Art Council’s reporting so that there is consistency over time. One statistic reported by the Auditor has created confusion on City Council, and has been mischaracterized by the press. The auditor calculated RACC’s internal expenses, including “salaries, staff training and rent,” as 33% of our overall budget of $11.2 million, but failed to provide any context for that number, leaving the impression that RACC’s internal expenses are excessively high. Working with the auditor’s staff and perusing public records at https://www.portlandoregon.gov/cbo/72512 , we were able to determine that RACC’s “internal expenses” are, in fact, very low compared to the city’s own bureaus. Portland Parks and Recreation has internal expenses of 40%, the Water Bureau is 51%, Equity and Human Rights is 84%, the Auditor is 85% and Fire is 86% — just to name a few. We believe that internal investments, including personnel, are essential to move the city’s agenda forward, but it is important for people to understand that “internal expenses” are not the same as “management and overhead” expenses. RACC’s independent financial audit confirms that 15% of our budget is spent on management, overhead and fundraising, while 85% of RACC’s budget goes toward program delivery. This includes RACC’s grant awards and public art commissions, of course, but also community engagement staff who actively connect people in underrepresented communities to our services and other arts experiences in town; arts education coaches who train classroom teachers to integrate the arts into their curriculum; and public art maintenance technicians who keep the city’s public art collection in tip-top shape. Notwithstanding the City Auditor’s misleading calculations, RACC supports the recommendations in the Auditor’s report. As reflected in interim executive director Jeff Hawthorne’s recent op-ed piece, we look forward to helping the City identify clear goals for arts and culture. In the meantime, RACC continues to strengthen our leadership role within the arts and culture arena. RACC has awarded more than 5,000 grants totaling $44 million in the past 23 years. Under our Arts Education programs, RACC builds capacity for teaching artists, educators, and curriculum developers to integrate arts into the K-8 subjects in the region, serving more than 27,000 students a year. For the past three years, RACC has been keenly focused on identifying barriers in arts access and pathways to better serve underrepresented communities. Our 2015 Equity Statement articulates the organization’s equity philosophy and frames how we operate, and we have conducted focus groups to understand barriers to access. More recently, our 2017-18 Community Engagement Plan lays out our strategies to equitably expand outreach, collaboration, and resource distribution efforts. Additionally, we have been developing new programming that fills in gaps in arts participation by artists from marginalized communities, with our Art & Power conversation series as an example. For more information on these and other RACC program accomplishments, visit RACC’s online annual report for 2017. We look forward to collaborating with the Mayor, the Arts Commissioner and City staff to implement these recommendations and better support culture, creativity, innovation and the arts in our community. Posted on May 18, 2018 at 10:55 am. The RACC board and search committee have fielded several questions in the last few weeks regarding the board’s decision to continue RACC’s search for a new Executive Director. We are grateful to community members for their keen interest in this process, and for asking questions and sharing their points of view. The RACC board stands by its process and decision to continue the search. More than 40 people – including board, staff and other community members – participated in the vetting of our last round of candidates, which unfortunately did not deliver the end result we hoped for. We are certainly disheartened that when offered the position, the finalist we chose was not able to accept. And although we are committed to transparency throughout this process, we cannot discuss the specific reasons for selecting or not selecting any candidate. If this was an elected position and not a Board appointment, a full public discussion of each candidates’ strengths and weaknesses would be appropriate. As it is, all the candidates asked us to sign non-disclosure agreements so that their current jobs would not be at risk, as is very common when recruiting at the executive level. And above all, a truly deliberative process. The search committee has been pared down to five RACC board members (Ozzie Gonzalez, Linda McGeady, Frances Portillo, Alejandro Queral and Steve Rosenbaum) and they will continue to engage the broader group of 40 community members and RACC staff representatives to vet additional candidates as the search continues. We remain open to further comments and critique about our process; the search committee email address is EDsearch@RACC.org. Posted on May 9, 2018 at 8:58 am. The committee welcomes your questions and input. Contact EDsearch@racc.org. Posted on May 1, 2018 at 4:50 pm. For the spring 2018 primary election, RACC distributed a questionnaire to all candidates running for Portland City Council; Clackamas, Multnomah and Washington County Boards of Commissioners; and Metro Council. Each candidate was asked five questions on March 13 or 14, and given the opportunity to respond by March 30 when this story was first published. RACC will continue to publish responses from candidates even after the deadline has passed. Here are the responses provided by Philip Wolfe, running for Portland City Council, Position 2. All responses are reprinted verbatim from what the candidate sent us on May 1. PW: I am an artist. I draw, paint, soft pastel, make films, act, dance, photography and so on. I love art. Currently I am employed with Portland Art Museum on board with accessibility task force. I advise architects after viewing the first draft of their drawings on a new building they are planning on building about how to make it more accessible for all. I am so excited and proud to be on their board. I look forward to this project come in fruition. PW: Arts and culture is so important because it brings communities together as a part of education, entertainment and appreciation for art. Arts shall receive more funding, not the other way around. All schools shall have arts. Because Portland is the whitest city in the US, racism, sexism, classism, ableism and audism are running amok here in Portland, sadly. Arts and culture is one significant way of ending oppression. I have a big dream of forming a Deaf history month, hopefully next year at the Arts Museum. I basically grew up on stage and that experience made a profound impact on me. Without art, life has no meaning. Simple as that. PW: Implement rent control. Tax large corporations. Affordable spaces for local businesses is important and needs support from our city as it promotes economic growth in our city. RACC: The city’s Arts Tax is disliked by some, while 62% of voters approved it. Thanks to the Arts Tax, every K–‐5 student in the City of Portland now as an art, music or dance teacher, and dozens of nonprofit arts organizations are expanding access to the arts by providing free and low–‐cost arts experiences for Portland residents. What changes to the Arts Tax, if any, would you want Portland City Council to consider? PW: I agree wholeheartedly that Art Tax is very important. City Council shall never remove this tax. I am thinking, why don’t we do more by taxing churches after all they are all about helping the poor? Churches lately feel entitled to discuss politics which shall be separate, while they are tax exempt. PW: I would host forums for all of them to have an opportunity to share ideas, concerns and needs. I will then bring their voices to our table with my team and come up with strategies how we can better support them. We need to stop buying developers from building more buildings and focus on priorities. We need to stop from freeways expanding and focus on other means of transportation, require all public buses go electric. We need to focus on filling the gaps in Portland to make it more accessible. I love the fact that Portland has many art festivals, however with renting space is very expensive. I think we should take a look at this and figure out how we can better support locals as surviving a new local business is brutal. I strongly object City wanting to take cannabis tax and invest in police. Posted on April 20, 2018 at 1:59 pm. On April 11 the RACC Board met and authorized a job offer to an outstanding candidate who was the Search Committee’s unanimous recommendation. Unfortunately, the candidate was unable to accept RACC’s offer due to the needs of a family member that surfaced last-minute. The RACC Board convened again on April 18 and voted unanimously to continue the search with Koya Leadership Partners and a new search committee of five board members, including two previous search committee members. The composition of the new search committee will be announced next week. Approximately 50 members of the community participated in the previous process. We will be inviting all previous participants to meet and review additional candidates, likely sometime around July. We are committed to continuing a process that is accountable, transparent, equitable, and one that listens to the community. The current job prospectus can be found here: https://koyapartners.com/search/racc-executive-director-21/. Interested parties who wish to apply or recommend a candidate should contact Koya Leadership Partners. We welcome your questions/suggestions/ feedback. Contact us at EDsearch@racc.org. Posted on April 11, 2018 at 11:27 am. Here are the responses provided by Greg Malinowski, running for Washington County Commissioner, District 2. All responses are reprinted verbatim from what the candidates sent us on April 11. RACC: In what specific ways have you supported arts and culture in Washington County? GM: I have been a strong supporter of Washington County’s funding for the arts. Two years ago, RACC was provided with $115K, an additional $20K was given last year, and this year we hope to add another 10K. All of the recent increases were directed to Tualatin Valley Creates, which provides workshops for artists and helps connect them with grants and other opportunities. I was also a supporter of the Capital campaign through the county for Bag and Baggage’s new venue in Hillsboro. RACC: Artists and arts organizations add measurable value to our region’s economy, our education system and our quality of life. Yet there are a number of pressing needs in Washington County that often compete with arts and culture for attention and investment. How would YOU describe the importance of arts and culture in our community, and what should Washington County be doing to support this sector? GM: Art has the power to inspire individuals and our entire community. Research has clearly shown that children who have a strong arts education tend to do significantly better in other subjects, including science and math. There are real economic benefits too – a study published by the Regional Arts and Culture Council shows that the nonprofit arts and culture sector in the Greater Portland Area generates millions of dollars in economic activity and provides over 11,000 jobs. Yet at the same time, arts programs in most of our schools are severely underfunded, especially those in low-income communities. Artists are our innovators, and as we plan for the future of Washington County we need to make sure that opportunities for artists are not limited only to wealthy schools and neighborhoods. To create equitable access to the arts we will need to generate more funding locally because the legislature is unlikely to act on this anytime in the near future. With a new progressive county commission, I believe Washington County will be well-equipped to take on this challenge. One approach would be to establish a small percentage, say at least 1% of capital cost in construction or reconstruction, to make sure that public projects dedicate some funding for art installations. Portland recently established a small Arts Tax to support art and music teachers in their schools, and with a more progressive county commission we may be able to refer a similar measure to the ballot. Washington County Kids, a local organization working to increase investment in afterschool programs, has proposed a special district for children’s services which could also be a way to support arts and music in low-income communities. This would also need to go to the ballot. I think the county can make substantial improvements in funding for local arts programs by implementing these kinds of policies. RACC: Washington County is currently moving forward with development of a $46 million events center at the Washington County Fairgrounds. Do you believe there is a place for the arts in future development of the fairgrounds site? GM: Artists should absolutely be included in future development of the fairgrounds. We have incredible artistic talent in Washington County and the event center is an ideal place to highlight it. Our institutions should reflect our culture and diversity; local art can help us express this to fellow community members and visitors. That being said, most of the installations for the main plaza, formerly called the veterans plaza, have been cut because of budget constraints. This is one reason I like the idea of requiring 1% of construction costs on public projects to be dedicated for art projects. That way, if something has to be cut, art projects are not eliminated. Washington County does not currently have a percent-for-art program. Would you support the development of a program to support more art at public facilities? GM: A percent-for-art program would create more opportunities for artists to be a part of the legacy of Washington County. As noted above, I would be very supportive of this type of measure, especially if we could ensure that local art is prioritized. RACC: What are some of your other priorities for Washington County that would be of interest to artists, arts organizations and arts educators in our community? GM: Right now, we have 72,000 people who make $21 an hour or less and commute into Washington County for their jobs, and for many, this is simply because they cannot afford to live in the communities where they work. Teachers, including arts educators, understand this problem well. It is unacceptable that the people we trust with our children’s education are being priced out of the neighborhoods they nurture. Instead of building affordable housing on the edges of our county where the transportation infrastructure cannot sustain rapid growth, and farther from where most of our jobs are, I want to rezone old commercial lots for mixed residential-commercial use along major roads like TV Highway. If folks are closer to the heart of the county, it will be less difficult to connect them with public transportation and other neighborhood services. Allowing more residents to live closer to their workplaces means that they can spend less time on the road and more time creating a better life for themselves, their loved ones, and their communities. Posted on April 10, 2018 at 3:15 pm. Here are the responses provided by Shirley Craddick, running for Metro Councilor, District 1. All responses are reprinted verbatim from what the candidates sent us on April 9. RACC: In what specific ways have you supported arts and culture in the Portland metro region? SC: Metro is very fortunate to have a close working relationship with the Regional Arts and Culture Council. The organization has advised and helped Metro staff select public art for two projects at the Oregon Zoo, Elephants Lands and the Education facility. The art is beautiful and contributes so much to the new elephant habitat and education facility. In addition, RACC has worked with Metro staff helping recruit artists each year for the annual Glean program transforming trashed and neglected items found at Metro’s Central Transfer Station in north Portland into art. Each year the items are displayed at a show at a local art studio. Many items become permanent exhibits at Metro facilities. RACC: Artists and arts organizations add measurable value to our region’s economy, our education system and our quality of life. Yet there are a number of pressing needs in our communities that often compete with arts and culture for attention and investment. How would YOU describe the importance of arts and culture in our community, and what should Metro be doing to support this sector? We all know that when artists begin to rent space in a neighborhood the area is on its way to becoming gentrified. Artists are the incubators helping languishing neighborhoods and business districts to becoming more desirable and successful. On one side this is great news. We want all neighborhoods to thrive, businesses to be successful and neighborhoods to be great places to live, but we also need to keep housing in a neighborhood affordable, so gentrification does not push the artists out. Metro’s performing art facilities have the opportunity to promote local artists by displaying artist’s works and hosting art shows. Multiple shows have occurred at various Metro facilities. The performing art facilities have over 1 million people walk through their doors each year. Metro supports young artists too. Using Metro Paint (paint recycled at a Metro facility) young artists have painted murals at a variety of structures that often tagged with graffiti. One way to support the art and culture community is to have adequate affordable housing. The Metro Council is exploring this challenge and hosting discussions with the regional community to prepare a plan to ensure there is adequate affordable housing in the region. We are considering asking the regional voters to support a bond measure that will allow housing to be built in all parts of the Portland metro region. Another way to support the art community is to encourage cities to create more zoning for more live/work buildings to be constructed or renovated. Allowing artists to live in their studios can be a significant savings. RACC: How can RACC and Metro do a better job of providing arts experiences for underrepresented populations, including rural communities, people of color, people with disabilities and underserved neighborhoods? SC: Annually Metro’s Arlene Schnitzer Concert Hall hosts performances for the Portland metro area Title 1 schools. The goal is to introduce young people, who might not have the opportunity, to be able to attend an artist performance. The Black Violin duo, Wil Bapiste and Kevin Sylvester, have performed the last two years for these young audiences. The two are classical violinist who perform Hip Hop. It is moving to see the young people respond to their performance. The children stand or dance in the aisles for almost the entire performance. This is a commitment that Metro has to help young people of our region. In addition, the Black Violin is accompanied by a youth orchestra. In addition, Metro’s Portland’5 provides free tickets and bus passes to students and teachers in Title 1 schools for performances that interest children, such as “Billy Elliot, The Musical.” Invitations also go out to Job Corp enrollees and Urban League families. RACC: What are some of your other priorities for Metro that would be of interest to artists, arts organizations and arts educators in our community? SC: Metro’s Park and Nature departments is beginning to contemplate how more nature-based art programs can be incorporated into the work that Metro does in our natural areas. Posted on April 4, 2018 at 7:41 am. Here are the responses provided by Lynn Peterson, running for Metro Council President. All responses are reprinted verbatim from what the candidates sent us. LP: I have been a big supporter of the arts in my elected official capacity for Lake Oswego and Clackamas County. In these positions I worked to set aside money for major art projects, and I understand that the creative sector is an important component of our economy. LP: Metro’s role is to think about the bigger picture, invest in the right systems and infrastructure, and help provide options for our residents to lead healthy and productive lives. This is as true for the arts as it is for transportation, housing, or parks. The arts bring us together throughout the region, both in local communities and at our major venues, to share experiences, connect with each other and the world, and challenge ourselves and our assumptions. I do not see this as a zero sum equation between competing needs. I have spent my entire career building complete communities, which include a good job and affordable living, a clean environment and connection to nature, and vibrant communities that feed the spirit. The arts are part of a complete community. That’s why I will be pleased to lead the agency that is responsible for the Portland 5 venues in downtown Portland. These gathering points anchor our downtown, contribute to our regional economy, attract tourism, and support our local artists. The Portland 5 facilities are all well run, but we need a regional conversation about how to invest in them for the future. Recently, Metro has launched the Placemaking Grant program, bringing artists into the mix as part of our regional planning and development work. I love seeing these projects as we create a future with local communities in places like the Jade District and downtown Oregon City. These grants are a great resource to support the local economy, and an important way to support culturally specific art and communities. This is a part of a larger affordability issue, which is a cornerstone of the work I would like to carry out at Metro. LP: Artists and creative ventures are suffering from some of the same issues as homeowners, renters, and local businesses. Our region has not prepared sufficient land for development, and prices everywhere have gone up. We have plenty of available land for all of these needs, but it is not located in complete communities with access to transit, commerce, and core services. This is especially important for artists and arts organizations that need to operate from within communities. We can do better. As Metro President, I will pursue plans for land acquisition that allow local jurisdictions to write down value for affordable housing, local business, and the arts–especially close to transit access. Metro has considerable experience land banking for natural areas, and can apply this experience to housing and development needs and in transit oriented development, the single most equitable form of transit/affordable housing provision. I support Metro’s current plans for a housing bond measure, and would link further investments to future transportation investments. We also can work with market-based institutions and foundations to bring new capital to invest in affordable options. Metro should also be working to avoid this type of crisis in the future by better establishing and forecasting community needs for every jurisdiction within Metro by housing types based on different economic scenarios. We need to recognize the different types of housing at all levels of income that our region needs. Additionally, there is a need for low-income stabilization so fewer people fall into homelessness. LP: One of Metro’s most successful initiatives is the Nature in Neighborhoods grant program, run through the Parks and Nature department and supported by voter-approved measures. These grants go out to community groups to connect people to nature, with a specific focus on equity outcomes. I believe we can better integrate the arts into these efforts, both in terms of capital investments and programs in our natural areas. I also think we can replicate this model in housing, solid waste, and transportation, integrating art with these strategies to build complete communities throughout our region. We also need to do a better job communicating our vision for the future to new generations of people in the region, both those growing up in our schools and neighborhoods, and those arriving from other states and countries. We need to partner with local organizations to understand today’s issues and challenges, and connect them with the enduring values of this region. There is a limit to what can be done with policy papers and powerpoint. We need to partner with RACC and our creative community to find new and exciting ways to imagine our future. My commitment to communities across this region that do not feel like they have a voice is to actually provide a seat at the table. This will occur in different ways depending on the type of decision and the community. These communities should feel more connected through time as Metro works to hire a more diverse workforce that will have input on ways to be effective with different populations. Metro should also work to diversify procurement and minority contracting goals. LP: Our region is growing by some 90 people per day, with lots of resulting challenges for housing, transportation, and economic opportunity. I believe that we need to make major investments along our regional lifelines–e.g. Powell, TV Highway, Barbur Boulevard–to create the complete neighborhoods we need. We can transform these places into centers for the arts, business, and vibrant communities. We have worked hard to make this region a great place to live, and we didn’t do it so that it could become a gated community for the privileged. Now is the time to make major investments so that there is room for all kinds of people. We need to reduce congestion and provide transportation options. We need all types of housing. Everyone should have safe sidewalks and access to nature. I invite RACC and our region’s artists to help me imagine and convey what this kind of future will look like and how it will feel for the people who live here. Posted on April 2, 2018 at 5:18 pm. Here are the responses provided by Kimberly Culbertson, running for Washington County Commissioner, District 4. All responses are reprinted verbatim from what the candidates sent us. KC: I frequently buy art from local artists, support our local theatrical companies and contribute to the Oregon Cultural Trust. I have not been an elected official, nor am I a person of wealth, so I advocate for the arts in my capacity on the Design Committee for the Hillsboro Downtown Association and the Urban Renewal Advisory Committee. I also have advocated for arts to be a stronger element in the redesign of the Hillsboro Airport, as I am on the HIO Master Plan Advisory Committee. I supported the renovation of the Venetian Theater as well as the development of Sequoia Gallery and The Vault, home of the Bag & Baggage Theatre Company. Moreover, I would promote a public drive to pay off the City loan on The Vault building, so that theatre can be created without the hindrance of a large mortgage. KC: Arts and culture are exceptionally important for our community because it is one of the drivers of our economy and defines our quality of life in Washington County. Our growing creative class can spur innovation across other fields. For many years, the focal point of arts experiences has been in the urban core of Portland, and our colleagues at Multnomah County continue to lead the state in their forwarding thinking and planning related to arts infrastructure. Of particular concern, throughout the region, is the decline in affordable performance spaces. As Portland “feels the squeeze” of ever growing property values and high rents, many arts organizations have found themselves priced out of the city. Washington County, too, has challenges related to available performance and creative spaces. Over time, artists and organizations in the Portland area will naturally begin to look outside of their city for more affordable spaces to create their work. Washington County has an opportunity to plan, support, and incentivize the formulation of such spaces, and should position itself as a welcoming, affordable destination for these creative entrepreneurs. It is important that we magnify this valuable sector. Washington County Commission can act as a megaphone to support creative people and organizations, just as we do manufacturing and technology. We can work with the many large companies in Washington County to partner in projects that promote arts infrastructure and capacity building, and in neighboring school districts and neighborhoods, we can design elements that enhance the aesthetics of our public buildings. We can also promote more collaboration with the arts community in our public spaces. Finally, as we lessen our deficit of affordable housing, our most pressing need, we should ensure that we are developing solutions for members of the creative class who are priced out of many of our communities. Helping artists and makers have the ability to live and work in our county will not only help to develop a rich and vibrant culture, but will also help us promote and grow these small businesses, bringing new revenue and jobs to the County. KC: Yes, the fairground Events Center should be an important element for promoting arts and culture in our community. The Events Center, as well as any future development, should take every opportunity to grow our creative community and facilitate spaces where people from all over the county can come together and create. Creativity does not preclude agricultural events, and I would advocate for the arts being showcased at our County Fair, an event that brought in 103,625 attendees in 2016. RACC: Washington County does not currently have a percent-for-art program. Would you support the development of a program to support more art at public facilities? KC: Yes, I would support a percent-for-art program as adding art into our public spaces brings a great value to our quality of life in Washington County. It also provides us a great opportunity to partner with our local schools and universities to showcase some of the amazing talents of our younger people. Public buildings should be gathering places and the arts can help to convene those gatherings. Percent For Art programs have been hugely successful across the nation in helping to create connection and community. The research is clear; public art lowers barriers to access to arts experiences for all residents. It can help create a unique sense of place, improve the overall quality of life, generate economic impact from cultural tourism, and bring together diverse groups of people for shared experiences. KC: I would like to see more local artists, designers and actors featured in the many film productions we foster in Washington County. Large production companies like Laika, headquartered in Hillsboro, can reach out to our communities to showcase their work and draw from the creativity our diverse county has. In my capacity as Commissioner, I would promote the arts in all aspects of our infrastructure and public works. I would also promote publicly showing the many corporate collections of art held here. Arts Learning and Education is also key; throughout Washington County, the arts have consistently been a target for cuts in school district budgets. As a result, many of our most vulnerable youth are attending schools without the benefit of exposure to the arts. I am a strong and dedicated advocate for the STEAM approach, which includes the arts as a key part of the focus on building the next generation of professionals and places arts as of equal value to science, technology, engineering, and math. Posted on April 2, 2018 at 8:35 am. The intricate artworks created by Northeast Portland artists, Arvie Smith and Mehran Heard, will be unveiled on the Natural Grocers façade later this month. The Alberta Arts District has been synonymous with culture, creativity and home for much of Portland’s African American community for decades. On April 18, 2018, the long-awaited works of artists Arvie Smith and Mehran Heard will be celebrated at the grand opening of the King neighborhood’s first Natural Grocers store. The rigorous selection process was managed by RACC and the artworks will be part of the City of Portland’s public art collection that is maintained by RACC. Each artist received a generous project budget funded by Prosper Portland to create vivid, community-inspired designs that honor the Northeast Portland community and its rich African American history. Prosper Portland (formerly known as Portland Development Commission) has worked at the intersection of Martin Luther King Jr. Blvd. and Alberta St., amongst many others citywide, to further economic growth and development. In 1997, the agency secured nearly two full blocks along MLK to revive a thriving, walkable commercial quarter. Now over two decades later, Prosper Portland is bringing the Alberta Commons project to a close. By early 2015, Prosper Portland called for another community vision process after Majestic Realty and Natural Grocers joined the initiative. The public working group collaborated to establish a Community Benefits Agreement (CBA) as well as several subcommittees to ensure the project’s delivery of goals which include prioritizing leases for existing local businesses and those owned by people of color, hiring neighborhood residents as often as possible, and approaching the project equitably during construction and beyond. The public art subcommittee requested RACC’s support to find suitable artists and proposals for long-term murals. “It’s particularly important to involve the community in the selection of the artwork [and to] also have that artwork represent the people [in the] neighborhood,” says Kuhn, who was part of the public art selection panel along with John Washington, who served as chair, and six other participants. Washington, a long-time advocate and community activist of the African American community in Portland, has served as the chair of the Soul District Business Association (formerly N/NE Business Association) since 2016 and felt drawn to an art and design role in the project after noticing a divide during the community development process. Although the camps were self-selected, the community engagement subcommittee was predominantly Black while the design side was mostly white. Other selection panel members appointed by RACC were Alem Gebrehiwot, Diana Moosman, Elijah Hassan, Hilary Pfeifer and Rick Tiland. Although the public art selection panel originally planned to collaborate with one local artist, impressive presentations from Arvie Smith and Mehran Heard reshaped the approach and resulted in two separate installation approvals. Washington said the panel members were amazed at how visually cohesive each proposal felt while also showcasing unique, distinct perspectives. Both artists have spent more than a decade each living in Northeast Portland but are a full generation apart. Still We Rise, by Arvie Smith. The final installation is 18 feet high by 22 feet wide. After spending most of his formative years in the South, Smith moved to South Central Los Angeles to be closer to his mother. Yet even outside of the Jim Crow laws’ primary boundaries, he found himself living in segregation all over again. He witnessed the rise of street gangs and the Watts riots of 1965 and says all informed his work and worldview. Although Smith decided he was going to be an artist after a fateful encounter with a carnival psychic who told him he could be anything he wanted to be in life as a child, it wasn’t until well into adulthood that he seriously pursued his passion. Portland had been a stopover during travels along the West Coast as a young adult, but the artist chose to make the city his home in the mid 1970s. He’s lived in Northeast Portland for over two decades. After meeting his wife, Julie Kern Smith, while working in a mental health facility, she gave him the push to pursue art school at the age of 42. In 1986, he proudly earned his degree from the Pacific Northwest College of Art. “I was the first American of African descent to graduate from that 100-year-old school in a state that was an exclusion state for people of color,” he says. Smith hasn’t stopped trailblazing since. In the past few years, Smith has celebrated solo and group exhibitions at the Portland Art Museum, in addition to a long list of previous national and international shows. One of his most significant accomplishments, however, came last year as Governor Kate Brown revived the Governor’s Arts Award after a 10-year hiatus and presented Smith with a lifetime achievement award. Smith’s expansive body of work, no matter the style or era, is always rich in storytelling traditions. 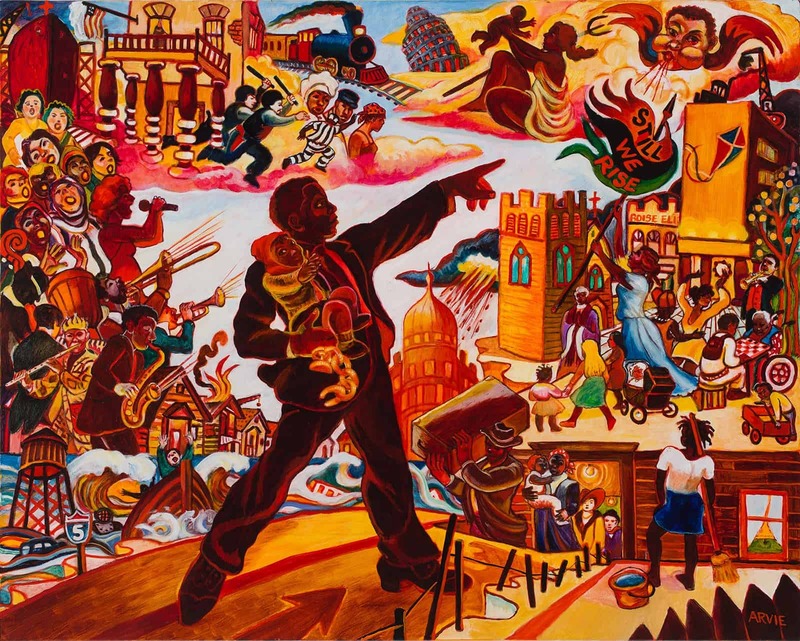 In his piece for the Alberta Commons project, a smattering of golden buildings, rapt citizens, and turquoise skies frame an African American man pointing towards the future. Each vignette retells Portland’s Black history like acts in a play: the demolition of Black spaces including the Veteran’s Memorial Coliseum, gentrification and redlining in Albina, and the city’s fruitful jazz scene. Upon closer examination, Smith can be seen intently playing a flute. Even as the piece acknowledges Portland’s traumatic history, Smith wants his work to uplift others. In homage to Maya Angelou, a flag that reads, ‘Still we rise,’ waves, albeit tattered, with the help of an airborne cherub’s gust. “My understanding is that it’s our ancestors blowing breath and vibrancy into our community,” the retired PNCA professor says. He encourages viewers who study the painting, however, to find their own meaning and story. Until We Get There, by Mehran Heard, aka Eatcho. The final installation is 10 feet tall by 17 feet wide. Heard says he’s had the need to “incessantly” draw since as long as he can remember. Although he was born in Los Angeles, California, Heard spent most of his life living three hours north in Fresno. “My first show was at a local café by the Fresno State College,” he recalls. When the chance to display his art along the blank, open walls arose, he swiftly tackled the feat with the support of his community. One friend played the music, another friend installed the lighting and a third friend printed flyers at his day job. “If you can’t wait for it to happen for you, you do it yourself,” he says. Heard continued to host his own art shows throughout California and completed his first mural when he was 19 years old. He has since created public arts across the west coast of the United States and abroad in Japan and Panama. Heard’s work is celebrated for his keen attention to detail and intricate, weaving designs. As a freelance illustrator, he works with independent musicians and large agencies such as Nike and Wieden + Kennedy to create album covers, editorials and more. A video about the process and work behind the murals can be found on the Regional Arts & Culture Council’s Youtube page here. The Natural Grocers ribbon cutting ceremony will take place on the morning of April 18 at 8:20 am. Attendees can enter the Natural Grocers grocery giveaway sweepstakes from 7:30 and 8:25 am on opening day for a chance to win free groceries for six months. An ice cream social with dairy and non-dairy treats will follow at 4 pm. Posted on March 30, 2018 at 2:07 pm. Here are the responses provided by Julia DeGraw, running for Portland City Council, Position 2. All responses are reprinted verbatim from what the candidates sent us. JD: Art has always played a big role in my life. I took piano lessons starting at eight years old and continued through college, acted in plays in high school, and sang in choirs throughout my youth and as an adult. Most recently, I was involved in a community choir that performed free shows for the public. My lifelong experience with the arts has taught me that no one should be denied access to art in all its forms, including live music. I went to public school in the Portland Metro area, and I loved taking field trips to see shows at the Keller Auditorium. Through these visits, I developed a life-long love of plays and musicals. I still enjoy going to a show and attending the symphony when I have the time and budget to do so. There are so many wonderful ways to experience art in our city. From murals on Martin Luther King Jr. Boulevard to sculptures downtown, art helps define Portland’s unique character. I love taking in and supporting the easily accessible art this city offers in museums, galleries, theaters, and public spaces. As City Commissioner, I will work to ensure art is accessible and affordable for Portlanders. JD: Art benefits our community in unlimited ways. 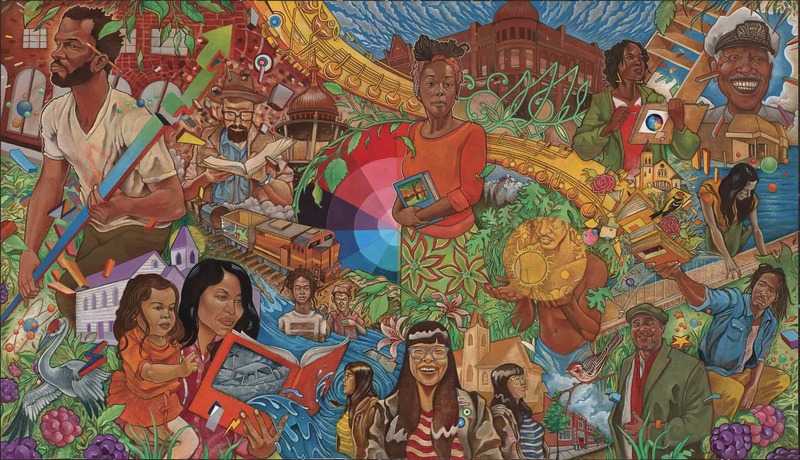 The arts reflect our societal and social experiences and present opportunities for change. Artists help us reimagine our world. Art can also help us better understand the most important issues of our time, like the climate crisis, racism, and inequality – understanding is the galvanizing force for change. The Regional Arts and Culture Council (RACC) keeps an overwhelming number of our small, local art nonprofits afloat with its funding support. I would like to see the City increase its collaborations to ensure that RACC is providing the best service possible for our local arts and culture. Portland has enjoyed a strong art culture for decades. Unfortunately, the artists who collectively created a kind of Portland brand that we know, love, and benefit from, are being squeezed out of the city as housing and other costs skyrocket. Our city must do more to ensure that artists are able to afford to live and work here. The City needs to get serious about creating permanently affordable housing, providing artist and small, local business incubator spaces, and working more closely with local artists and schools to ensure more local art is on display and available to the public year round. JD: There is a dearth of affordable spaces for creators and artists to live and work. We must start to think outside the for-profit developer box to create permanently affordable housing. We should look toward community land trusts and other community ownership models, as well as launching a visionary public option for affordable home construction. Some new apartment construction could include living and working spaces for artists. The City should also make it easier for those committed to creating and providing affordable art-making spaces to do so. As with most issues, artists of color, those from the LGBTQIA+ community, and those with low-incomes are often hit the hardest. These groups should be prioritized in solutions the City explores to support our arts and culture in Portland. The City and Prosper Portland should break up some of the huge grants and contracts it gives to out-of-state companies into smaller, Portland-based, community-level projects. Funds could also go toward providing incubator spaces and a centralized resource center for small, local businesses, including arts-related businesses. JD: I support the Arts Tax. The current Arts Tax costs $850,000 to collect and administer and raises $10 million. It doesn’t meet the 5% threshold voters agreed to for the cost of collecting the tax. We must improve how the tax is collected and administered so that more money can go toward bringing the arts to Portlanders. The need to fund the arts doesn’t stop at the Portland border. I support expanding the Arts Tax Metro-wide and making it a more progressive and equitable tax to reduce the burden on lower income Portlanders. If Metro follows a less collection-intensive path, everyone in Metro will benefit, which seems like a logical step to taking this kind of tax statewide. I’m pleased that the current Arts Tax funds art programs at Portland schools. However, ideally, Portland Public Schools would receive adequate funding from the state – including for arts programs – which would allow more Arts Tax money to go to local artists and programs. For now, it is a good emergency life support system for arts in schools, but there is clearly room to improve the Arts Tax to help ensure it accomplishes what it was meant to do. JD: One of the reasons the arts have gotten short shrift in Portland is that our form of government is ineffective. For one thing, it isn’t representative of Portlanders. Due to Portland’s Jim Crow-era, at-large election system, all but one City Commissioner lives in Southwest Portland. I live east of 82nd Avenue, and if I were elected tomorrow, I’d be the only commissioner living east of Cesar E. Chavez Boulevard. Our at-large system, which requires candidates to win expensive city-wide elections, came from the Jim Crow era and was designed to exclude people of color, working and middle-class voters, and women. We must end Portland’s at-large election system by creating City Council districts to achieve equitable representation for all Portlanders. We should also dismantle our current commission form of government, in which elected officials are more beholden to their bureaus and wealthy donors than they are to the people of this city. The lack of representation is not just geographical. In a more democratic and representative system, all of Portland’s diverse communities – including artists, art organizations, and art educators – will have more power in the City’s decision-making and elections. The current city government structure consolidates power and lacks transparency and accountability. It is past time for us to shift to a more equitable City Council that prioritizes the people of this city over developers and corporate interests. Posted on March 30, 2018 at 2:02 pm. Here are the responses provided by Christine Lewis, running for Metro Council, District 4. All responses are reprinted verbatim from what the candidates sent us. CL: Portland’s creative energy and vibrant culture were important factors in my decision to make the region my home after completing school here. I grew up dancing, performing in plays and musicals, constructing stage sets, and operating the light board for numerous productions. I understand firsthand how important the arts are for youth to connect to community and find their voice. One of my favorite Portland organizations, p:ear, provides arts education for homeless youth, and I have supported p:ear with my personal financial support, volunteer time, and by purchasing a youth-produced painting for my home (the proceeds going back to the artist). I serve as a member of the Portland Opera’s Ambassador Board, where I have the opportunity to connect a younger audience to the art form and to the diverse and dynamic company. We spearhead the Young Patron Society and plan social events to bring music and artists outside of their traditional venues. Aside from opera, I regularly attend shows across the spectrum of the performing arts, from ballet to experimental theater. I have a deep respect for visual artists as well, and try to purchase local work and support emerging artists. Finally, I have worked in local and state government in offices that have supported the arts, from increasing funding for RACC at Multnomah County to the increase in incentives for film and video production when I worked for the Speaker of the House. A thriving arts scene helps expose area residents to new manners of thinking and promotes democratic and creative expression within the public sphere. CL: My mother was a museum curator, my mother-in-law teaches art at a public middle school, and my father-in-law has made his career in the film and television industry. Arts and culture organizations are significant employers and important players in our region’s tourism economy. Arts and cultural activities increase the health, vitality, and resilience of communities. The arts should not be competing with the pressing needs of our communities, but should be viewed as a component or complementary to these needs. The arts can play a key role in promoting public health, restorative justice, and youth engagement. I recently had the opportunity to take a tour and visit with leaders with the Philadelphia Murals Project Public, a national model for addressing community needs and changing neighborhoods through art. Art that germinates with community input has the ability to transform neighborhoods and promote community wellness. Metro plays a critical role in placemaking, and public art and cultural venues are a critical component of designing community spaces. I am supportive of public art as a way to foster community conversations as part of the planning process, and will bring focus on the arts to Metro. Nonprofit arts organizations employ over 11,000 people in the region and generate $330 million in annual economic activity. These numbers would be larger if creative for-profit companies were part of the economic study. Arts and culture are a major factor in our region’s livability. Artists and arts leaders should be at the table along with other significant business sectors when crafting public policy. CL: The region’s affordability crisis is continuing to grow more pronounced, but many in our community, including artists, have been long-affected by the increased costs of market rate housing and creative space. We need more housing affordable at all income levels, and as the campaign manager of Portland’s historic and successful 2016 housing measure I have experience working with diverse stakeholders to find workable solutions for housing. Additionally, we should have data on housing availability and development in the pipeline available for the entire region, so that we can be strategic in working to meet the housing need, knowing that the solutions will look different in different communities. As neighborhoods change we should commit to preserving creative spaces for artists and arts organizations. With an eye to Metro’s 2nd District, there is definitely a need for more creative space to support artists and organizations in Clackamas County. More directly, I would like to see Metro take a more active role assisting with the financing of capital needs of non-profit arts organizations. This could be done at little to no cost to Metro through tax-exempt conduit bond financing, which in essence conveys a tax-exempt interest rate to these organizations without creating a liability for Metro. I would like to see more coordination between Metro and the Oregon Facilities Authority on this front, possibly with Metro serving as an “agent” for these organizations. CL: In order to better reach audiences of underrepresented populations, we need to support and highlight art produced by and in those communities. RACC has led by example by taking intentional steps to diversify its leadership and board. The move to integrate the Arts Equity Grant criteria into the general grant process is particularly significant from the Metro perspective since Clackamas and Washington Counties will now have access to these targeted funds. Finally, marketing with diversity in mind can help bring in new audiences, particularly if accessibility information is easy to locate and barriers to entry are minimized, including pricing. RACC and Metro can help subsidize arts in the community, bringing artists and performances into venues that are comfortable and accessible to the populations we know we need to better serve. CL: Today our region is facing a lot of challenges. We are at a true turning point. Now, more than ever, we need a Metro Council that connects with and convenes local governments, businesses, constituents, and communities who are all too often otherwise left out. I will bring a focus on housing and transportation and working on livability and sustainability across the region. For our artistic community to thrive, we need to foster safe and affordable spaces, reliable support systems, and a prosperity sufficient to meet basic human needs. Artistic expression — especially that which has a significant cultural voice — is not often enough wooed by private sector investment. It is therefore up to community leaders and coveners like Metro to create those avenues for investment in the arts: financially and in terms of a supportive infrastructure that encourages and allows for creativity. This is our region’s brand, and a large part of what makes our region special. Posted on March 30, 2018 at 1:56 pm. Here are the responses provided by Stuart Emmons, running for Portland City Council, Position 3. All responses are reprinted verbatim from what the candidates sent us. SE: I am an architect, I am an artist. I went to art/architecture colleges at Rochester Institute of Technology School for American Craftsmen (http://emmonsdesign.com/woodworking.html), London College of Furniture, PSU and Pratt. I understand personally and deeply how art is important for our culture and our community. I go to art museums and art galleries frequently, and love public art. SE: Art is essential to our community. It gives us hope, it makes us think, it nourishes our mind and relationships, it gives us ideas, it gives us joy. Portland should be doing a lot more supporting this sector. Let’s start with a Commissioner who goes to art openings more, helps to teach a few art/architecture classes in our elementary, middle and high schools, goes to art & architecture critiques at UO, PSU, Art Institute, OCAC, PNCA, Reed, PCC and other colleges, reinstates Portland Design Festival, works to increase art events like to former festival at the Jupiter Hotel, and I welcome many other good ideas. Portland should make it easier to be an artist in Portland by having affordable housing and studios. I will help build art awareness. I will be one of the biggest art supporters City Hall has ever seen. SE: I am a housing expert, and have designed affordable housing projects throughout my career. I have decades of real world, private sector experience actually getting projects built, and not just talking about them. I understand housing economics, construction, and affordability. I am also an innovator, and have worked for the last 7 years in modular/prefab housing and am always looking for solutions that house more people, more economically, more rapidly and with increased design, sustainability and quality. The same goes for studio space, and commercial space for non profit arts organizations, and arts related businesses. I have a wealth of ideas on how to increase affordability, and the passion and skillset to make it happen. I also am a good listener and look forward to what the arts community wants and recommends. SE: I am delighted the Arts Tax has brought art back into many of our schools, and is helping our entire arts community. I would not change the Arts Tax. Every kid has an equal opportunity to have a fulfilling life. Build community, end racism through art. Posted on March 30, 2018 at 1:51 pm. Here are the responses provided by Loretta Smith, running for Portland City Council, Position 3. All responses are reprinted verbatim from what the candidates sent us. LS: As County Commissioner I’ve regularly supported and voted for more funding for the arts. From ensuring we follow the percent for the arts program, to seeking more dedicated funding for arts in our schools, I’ve been a consistent supporter of increasing access and funding for the arts, especially within our underserved and historically disadvantaged communities. I’m a strong supporter and champion of the Literary Arts program at our Multnomah County Library connecting our young people with local artists and exposing them to the benefits of being involved in the arts. I’ve also regularly sponsored Black Women for Peace’s yearly P.E.A.C.E. festival which champions young men and women to be catalysts for peace in their communities by focusing on performing arts and cultural exchange. LS: The arts and our creative class in general are incredibly important, not only to our quality of life but also to our local economy. Portland’s vibrant arts community is something that attracts people and businesses from all over the world. In many ways it’s because we have worked to foster such a great community for artists, musicians, performers, designers, and makers that we’ve seen so much of the growth we’ve experienced in the past decade. The City of Portland should do all it can to promote and maintain our creative culture. We should be looking for more ways to ensure that the benefits that come from being tied into a creative community are shared by everyone in Portland by working to increase equity and inclusion in the arts within our underserved and historically disadvantaged communities. LS: There’s no question that addressing our affordability problems must be a top priority for everyone on Council. The only way we are going to solve this problem is by taking a holistic approach to housing and affordability. We need to build more at all levels, so we can relieve the burden on the affordable housing stock. By ensuring we have enough housing at all income levels we can protect our affordable housing stock from being poached by the market. We also should look at innovative ways to increase our affordable housing stock without building new units. I’ve been told that often times the cost to build new affordable housing is prohibitive, and when it is added to a mixed project it can lead to increased costs for everyone. One thing I’ve been working on is utilizing the MULTE (Multiple-Unit Limited Tax Exemption) program to provide an offset for new development when they take existing units and convert them to affordable pricing. This would promote the production of more housing across the board while immediately increasing our stock of affordable housing. I also want the City to help property owners clean up the 900 documented brownfield sites in the City of Portland with the stipulation that the land be used for new affordable mixed use properties. We could provide some one-time only funding dollars, and low cost loans to promote the cleanups. This would also help to increase the stable of affordable housing we would have in the more central city areas, rather than pushing all affordable projects to the outer east. With Brownfield cleanups and Land banking we use the City’s resources to grab properties before they enter the speculative market and promote affordability in housing, mixed live/work space for the creative class, and affordable work space for small businesses. I also think we could utilize and perhaps expand the Portland Inclusive Startup Fund to engage more arts based businesses to lay down roots or expand in our communities. LS: I support the tax and don’t think we should revisit it at this time. A majority of Portlanders voted for it and I’m glad we did. I’ve been a consistent champion for our youth, and providing them with opportunities and outlets like arts, music, and dance instruction is a necessity if we want to see them succeed. I also believe that increasing and expanding access to the arts to underserved communities opens new doors for innovation and opportunity for those who have been historically disadvantaged. If anything I would love to see us go further, partnering with businesses in the creative sector and non-profits to get more of our young people directly active and participating in the arts. Increasing equity and inclusion in how we promote the arts is also something I would like to see some more focus on. Expanding access is a great first step, but I’d like to see more Portlanders of color actively engaged and encouraged to make art, tell their stories, and help make our creative culture richer through their participation. LS: Without a doubt our affordability crisis is a top priority for everyone, and I think keeping an eye on how we ensure that we are providing affordable live/work spaces for our creative community is a must. This also touches on issues around those experiencing houselessness as increasing economic instability and increased rents has put many on our streets. We need to increase our stock of housing at all levels, seek innovative solutions to promote new affordable housing, and provide adequate shelter space with connected services to help those struggling with addiction or mental health crises. We also need to bring more living wage jobs to Portland and provide more opportunities for women and people of color to start new businesses within their communities. I helped to start the Portland Inclusive Startup Fund to do just that, and on Portland City Council I plan to do more to help support our entrepreneurs and small business owners. I know this is important for artists and our creative community because so many of them are participating in that space. The City should partner with them and harness the great work they are doing, providing them with whatever assistance we can to help them grow their businesses and get more people in their communities involved. Posted on March 30, 2018 at 1:45 pm. Here are the responses provided by Andrea Valderrama, running for Portland City Council, Position 3. All responses are reprinted verbatim from what the candidates sent us. AV: I am very proud that as a David Douglas School Board member, we have worked to keep the arts in classrooms throughout that school district. It is unfortunate that we are the only Portland school district which has kept arts in their classroom, there is a need to fund arts in our schools and will work for that when elected. My family and I are also lucky enough to attend a number of performances in Portland each year. AV: A city without a vibrant arts and cultural scene is a drab city with no soul. I believe that as community leaders and ambassadors for the city, City Commissioners have an obligation to celebrate and promote our artists. Although, as you say, other pressing needs compete with arts and culture for investment, I would not join those who regard the City’s minimal General Fund investment in RACC as a frivolous “pet project.” I would like to see the City explore ways to use lodging tax revenue to support the arts. Beaverton is using lodging tax revenue to support a performing arts center. The tax is designated for tourism promotion, and some hoteliers objected to Beaverton’s action – but arts investments do indeed support tourism. One thing the City can do is encourage the State to be a better partner on arts and culture issues. The State should use lottery funds to support critical investments in the arts, recognizing that arts investment is economic development. Another way Portland can be more supportive of the Arts is by increasing the supply of creative spaces and making them more accessible for arts organizations. I support Commissioners Fish and Eudaly’s 22-point plan to preserve and expand affordable arts space. Portland is in a Housing state of emergency, and every day more Portland individuals and businesses are more on the verge of displacement and housing instability. I’ve been there –and I know how difficult it is to get back on your feet after experiencing homelessness. My strategies for bringing housing and creative spaces for affordable for Portlanders, nonprofits, and businesses include: 1. Increasing the Supply of Affordable Housing & Creative Spaces 2. Stabilizing Rising Housing & Commercial Leasing Costs 3. Displacement Prevention & Mitigation (Wealth Creation). Bringing affordable housing and creative spaces to all Portlanders is going to require a combination of new development, supportive housing, revenue reform, securing new shelter space and making current shelter space permanent, tenant protections, displacement prevention and mitigation tools, and finally, support for homeowners. As Portland grows, the supply of affordable housing becomes more urgent, and we need to ensure that the supply conversation doesn’t center around new multifamily rental construction at market rate but rather, new construction specifically for 0-60 MFI households, preservation of our current affordable housing supply, and acquiring buildings and properties that have been land banked instead of constructing new. It would also be a top priority of mine to urge our state delegation to lift the preemption on rent control and just cause eviction standards so that we can directly stabilize rising housing costs. I am proud to have worked on the City’s mandatory relocation assistance ordinance this year, mandating that landlords in Portland pay relocation assistance to tenants experiencing rent increases of 10% or more and tenants being evicted for no cause. In my elected capacity, I would continue to advocate for similar tenant protections including landlord registration, broader screening criteria, and security deposit reform, policies that could help minimize the impact of rising housing costs. Lastly, I am very interested in championing a policy that would subsidize nonprofit organizations and local businesses if their commercial rent increased over 10% in the past year. The housing crisis that the City of Portland is currently experiencing is also an affordability crisis, and we must include strategies that generate wealth prevent displacement of not just individuals, but of our local nonprofit organizations and businesses. This includes providing subsidies during and after construction, providing educational opportunities so that businesses can adapt to a changing consumer base, and policies that support both the business and worker. AV: I am concerned by the fact that under the Arts Tax, someone who makes $30,000 a year pays the same $35 tax that is paid by someone who makes $1 million a year. I am also concerned that the Arts Tax has not brought in as much revenue as projected; the practical effect of that has been that although the tax has been a boon to schools, it has been of little help to actual arts organizations. I would support asking the voters to change the Arts Tax to a more traditional income tax in which people pay in proportion to their income, and as part of that restructuring I would ensure that it brings in enough money to meet its original goals. I also am concerned about the fact that the City Council sold the Arts Tax to voters with an unrealistic promise that administrative costs would be less than 5%. That is another reason to send the measure to voters again, without such an unrealistic promise. I am confident that voters, having seen the value of the Arts Tax, would re-approve it in a revised form. I would also consider allocating some of the new revenue to displacement mitigation of arts nonprofits and businesses. Any changes would of course need to be discussed with the Arts Community. As someone who sold my own original music CDs out of the trunk of my car to pay my way through college, I’m a firm believer in supporting artists in the development of their business and artistic talents. In the City of Portland, I know that we can do a better job of doing this by providing the resources and spaces for our aspiring and established artists to share their talents and earn enough to continue to thrive in this city. I’m also passionate about providing our youth with the opportunity to access to the arts, not just through their school but through their community. Portland City Council can do this through partnering with local nonprofits and schools to subsidize internships or arts lessons, and then leverage those skills learned by providing opportunities for youth to perform at various city events. Lastly, I am particularly interested in ensuring the stories of the many cultural heritages we have represented in the City of Portland are not lost, and that we are lifting up those organizations and individuals who are carrying on their cultural traditions through their celebrations, festivals, performances, and languages. Posted on March 30, 2018 at 1:40 pm. Here are the responses provided by Ryan Deckert, running for Washington County Chair. All responses are reprinted verbatim from what the candidates sent us. RD: I support the arts in Washington County every day as a patron, citizen, donor and human being. In the next week, my family will attend two plays – one at the Beaverton Library as part of the Beaverton Civic Theatre’s 2018 season and then Hamilton at Keller Auditorium. Last week, I chaperoned my daughters elementary class to Oregon Children’s Theater rendition of Casius Clay. We are regular attendees to musical concerts, theater and art shows. One of the reasons I am running for Washington County Chair is to foster a greater sense of place and community in the county. A first order of business is how we design neighborhoods ensuring we have community centers, public spaces, parks and transportation options. Central to a well planned community is ensuring the arts are integrated into all aspects of design providing that richness of creativity, freedom and expression. RD: I do not view artists and arts organization in competition with human services, libraries, transportation..etc. The arts are integral to a full human experience and public investment often is the only life line to ensure all citizens have access to their full potential not just those who can afford tickets to an exhibit or show. Perhaps the best bumper sticker ever summed this up: art saves lives. I will reverse Washington County’s regrettable distinction as the lowest per capita supporter of arts organizations among Oregon’s 37 counties. Washington County is the most ethnically diverse county in Oregon, the economic engine of the state and on path to be the most populated county in the state. Part of modernizing the county will be to reverse our outdated track record of ignoring investment in artists and arts organizations as fundamental to a well-rounded community. One of my first accomplishments as a state senator was to restore arts and music funding to K-12 schools in Oregon. RD: I believe the arts should be included (or at least considered) in all projects/programs Washington County invests in – including the new events center at the Fairgrounds. I have many questions surrounding the $46 million events center but incorporating the arts will not be one of them. A hallmark of my service will be to change the culture at the county with respect to the centrality of artists and expression in the mission (and daily work) of our county. RD: I have generally been very supportive of the 1% for arts and am open to incorporating that into projects/programs in Washington County. I am certainly committed to dramatically increasing funding for artists and arts organizations as we modernize Washington County. RD: Artists, arts organizations and educators are often the vanguard of expression and defenders of freedom and human rights. Washington County needs to speak more forcefully defending our immigrant community, DACA students and LGBTQ neighbors. All are under threat today. I will use the bully pulpit of Washington County Chair to speak clearly on these issues reassuring threatened citizens that we are a safe, welcoming home removed from the divisive rhetoric and actions we witness in Washington DC.